Happy Wednesday! I hope that you are all well and ready for some mid-week inspiration? If you answered ‘yes’ to that then you’re in luck as my fabby teamies at From the Heart Stamps have some great samples to share with you over on the BLOG. My card today is what my children will be giving to their little cousin Harry who will be 19 months old at Christmas. Seems fitting then that this image is called Happy Harry! He is one of Faith’s Project 100 Snowmen which means while this project is in progress it is only $1 in the store – super bargain!!! I also used a Presscut Stepper Card Die, Marianne Snowflake and Tree Dies, Spellbinders Banner Die, Spellbinders Square and Scalloped Square Dies, Sizzix Scalloped Border Die, Centura Pearl Card, Papermania – Capsule Collection Festive Spots and Stripes, Papermania Shimmer Dome Stickers and Spectrum Noirs to colour. Next > From the Heart Stamps November Blog Hop! Lol!!! Thanks so much for stopping by Nicole – it would be lovely wouldn’t it?! Just got to buy that winning lottery ticket……!!!! Oh Karen. This card really makes me smile!!!! Adorable and I love all your fantastic die cuts! So CUTE!!! Super cute! Love the fold and all the great detail to create this fun scene! WOW! This one is fabulous! 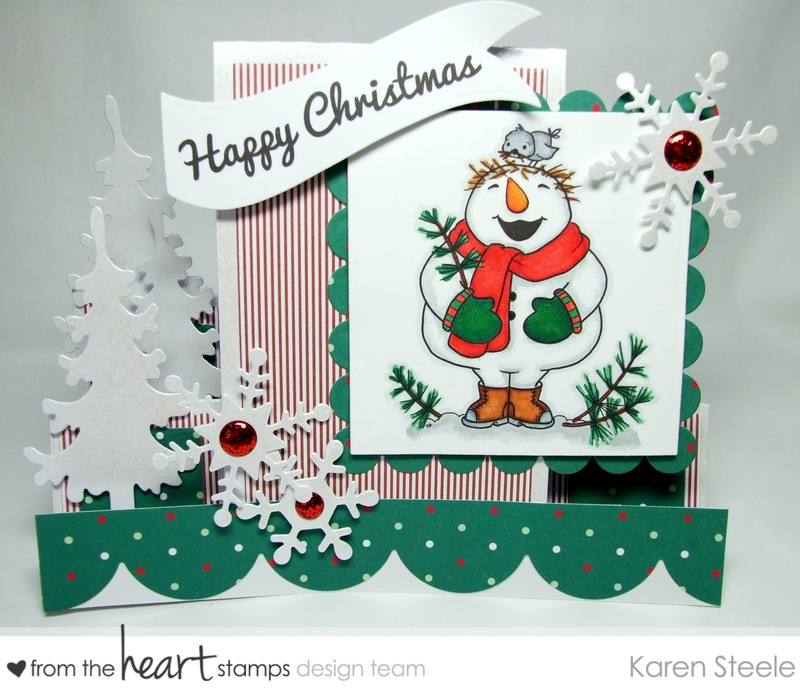 I love all of the elements that make up this step card (a fun fold for sure) and your harry is adorable! Karen, this one is more than a smiler, it made me chuckle, its SO cute! Harry is a lucky little guy. THIS IS A WOWZER! Amazingly beautiful. Great work.